It is not known when the first Burton Club was formed but it is possible that many more matches than one recorded in the Leeds Intelligencer and detailed below were played at the end of the eighteenth century. 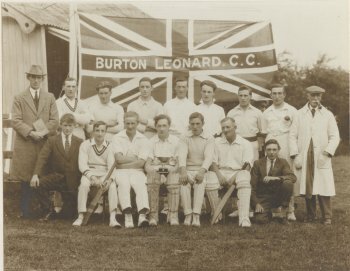 It is known that a Ripon team existed at this time so it is quite conceivable that a team from Burton Leonard played them. Unfortunately there is almost no records of local cricket in this area until around 1850. The match between the above Clubs was played on the Stray opposite the Granby Hotel on Saturday afternoon last. The Peep 'o Day Boys it should be understood are a number of wide awake young fellows who have only lately formed themselves into a Cricket Club. Though they have had very little practice they had hardly expected to accept a challenge form Burton Leonard, an older established Club. However fortune favours the brave and as it is the early birds who get the worm, the Peep 'o Day Boys got the score, the winning score. The match began at about 1-30 when the Members of the 2 Clubs bent themselves to the bat and ball with all the assurance of 'All Englanders' and with commendable will and energy considering the heat and dust. The Burton Leonardites went in first to the bowling of Messrs Jowett and Walker and obtained a score of 25. The Peep o' Day Boys went in and put their opponents in the shade scoring 48. The Leonardites then played their second innings scoring 28 after which the Peep 'o Day Boys decided the game by gaining 29 runs making a total of 77 against their opponents 53. The return match between these Clubs was played on Saturday last when the Peep 'o Day Boys again came off victorious winning with 8 wickets to fall. The day was fine and being a feast there were a large number of spectators. On Saturday last a match was played between Kirklington and Burton Leonard which was won by the latter in one innings. On Saturday last a cricket match was played at Kirklington between Kirklington and Burton Leonard, the latter winning by 39 runs. 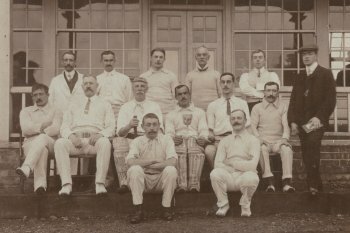 During the next twenty years the club flourished and in those early days players would make great sacrifices to ensure their presence on the cricket field. 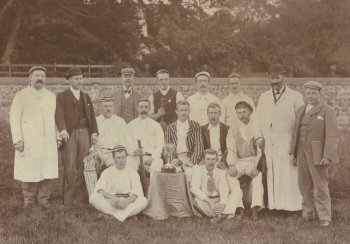 In 1895, when the Ripon League was formed, Burton Leonard rose worthily to the occasion and carried off the trophy for four consecutive seasons. The Cricket team was noted for miles around as being almost invincible. Amongst the members of Burton Leonard's team were representatives of the families of Hymas and Hardy. Amongst the numerous famous men against whom they were opposed was Dr W.G.Grace and George Freeman......William Hymas of the Burton Leonard side was said by all who met him to be the most scientific batsman in Yorkshire. Unfortunately the Ripon League was dissolved soon after 1898 and not revived for many years. The dissolution of the league had a discouraging effect on local cricket, and the departure of several prominent players did not help matters. In what seems an incredibly short time enthusiasm sank so low that by the end of the century the club had ceased to exist, though "pick-up" matches were still played, usually at feast time. During this time the story of the club had a chequered pattern of light and shade. Re-Born at the beginning of the century it rose to cup-winning form in the Ripon League and enjoyed several successful seasons notably 1909-1912, two of its outstanding players being E.Jacques and C.King. 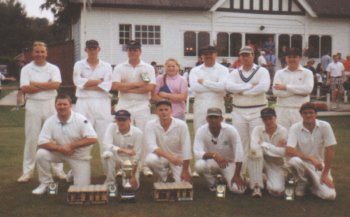 Their experience stood them in good stead after the war and for ten years it had an another prosperous run, this time in the Harrogate and District League, Division 2. Again the cup was won and on two occasions the team finished as runners-up. A feature of the club in those days was the flag that flew by the side of the cricket pitch. In 1929 it was hauled down for the last time, the club was disbanded and the square at Holber Hill lay deserted for many a long year. Even the pavilion was sold. However, in 1947 at a meeting convened by Henry Diggle, it was decided the Burton Leonard & Copgrove Cricket Club should once again enter the circuiting lists. The first season saw only two victories and one remarkable match against Nidd which ended in a tie with both teams scoring eleven. In the winter of 1948, the cricket field on Holber Hill was ploughed out and the club was forced to find a new home. Thanks to the co-operation of Viscount Mountgarret, Mrs E Gill and Mr A Gill the club was allowed the use of part of the home pasture along ScarahLane. 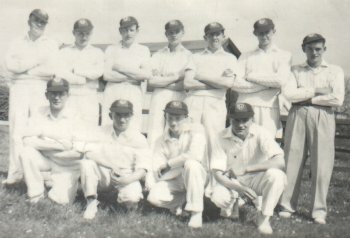 In 1949 the club joined the Nidderdale and District League, Division 2 and for the next two seasons finished near the top of the table. In 1966 the club moved to its present home off Peter Lane after Mr. Skirrow aggreed that his field should be used as a sports field. The present field (4 acres) was bought four £800 and a grant of £1300 was received from the government. The field was cleared and sown by voluntary labour. The tennis courts were made by Mr Skirrow and helpers. A Sports Association was formed and the field now boasts five different sports played through the year, football, cricket, netball, tennis and bowls. A recent Lottery grant has allowed the Association to upgrade the pavillion resurface the tennis courts and generally improve facilities for the benefit of the village clubs. "Burton Leonard - Past & Present "